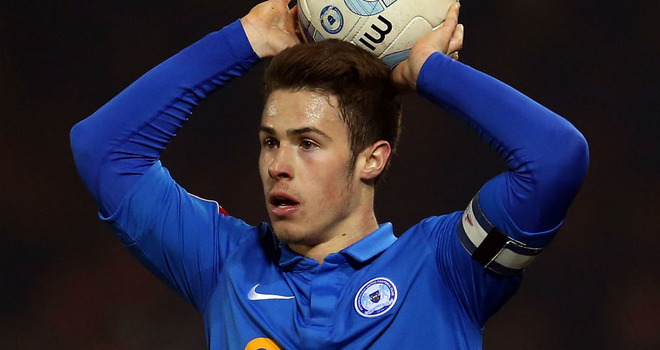 Posh Skipper Tommy Rowe – Leeds Target? Football transfer rumours can be so trying when one party to any negotiations seems utterly determined to tap into the emotions and frustrations of the only group of people unable to influence the transaction in any way, shape or form – the hapless fans. This rocky path is being trodden again according to reports today – first we hear that Peterboro chairman Barry Fry has decided to go public with news of Leeds United’s alleged interest in his club’s skipper Tommy Rowe. The chosen Fry spin is calculated to heap the pressure on the Elland Road club – to smoke them out into the public arena despite the preference of United to transact their business under cover of secrecy, Matt Smith of Oldham being a recent example. Fry though has the obvious selling chairman’s interest in trying to hype up the story and drive up the price – after all, Rowe has only a year left on his contract, and Peterboro will be understandably anxious about the prospect of their prime asset dwindling in value as time ticks away on that deal. Barry Fry is a canny character in his loud-mouthed way, and he has opted for two lines that will have Leeds fans gnashing their teeth and tearing their remaining hair in displays of biblical anguish. Firstly, he has raised the spectre of “Leeds don’t have enough money” – that alone is enough to touch ragged nerves in thousands of LUFC-obsessed souls around the world. Even more mischievously, he has suggested that there has been a phone call from one K. Bates Esq. which is a not-so-subtle way of twisting the “finances” knife. Fry will not be unaware that the best way to further rattle an already rattled Leeds fan is to mention Uncle Ken’s name in such a way as to suggest that his hands are still on the tiller (or his fingers still in the till). The genial Barry will doubtless feel that if he can mobilise an army of naffed-off Whites fans into expressions of discontent on both the financial and Bates fronts, this will heap pressure on Leeds and force their hand, at least in terms of publicly confirming or denying the story. Either way, Leeds preferred method of conducting transfers – silently until all is done – seems unlikely to be allowed in this case. Meanwhile, Fry – a former Man U trainee – has further fanned the flames by confiding in Radio Leeds that Rowe – a former Man U trainee – is keen on a move to Elland Road. He’s certainly doing his best to drum up interest in a likely lad – doubtless a good player, but not one whose name was exactly on everyone’s lips prior to today. The effect is to stir up Leeds fans into a state of indignant pessimism over a player they would never have heard of as recently as Wednesday. Is this a good way to do business? If Leeds really are interested in Tommy Rowe, it remains to be seen whether they can do a deal, and if so on what terms. But the Barry Fry effect is likely to have a bearing on the transfer, one way or another. Whether he’s doing his apparently want-away player, or indeed his club, any real favours is a matter of some speculation. As a Leeds fan, I’d hope that the club will not be influenced by this kind of gun-to-the-head opening gambit. There are plenty more fish in the sea, and Tommy Rowe’s most recent CV entry is relegation to League One. Perhaps Leeds should continue to try to take care of business in their own way, and let the likes of Barry Fry hog headlines while he can, but ultimately reap what he sows. This entry was posted in Football, Leeds United, Life, Sport and tagged Barry Fry, Leeds United, Peterborough United, soccer, transfer window, transfers, UK Football. Bookmark the permalink.